Dan has now chosen to speak out about his days with Lou and the circumstances that led to their parting. Dan provides insights into a Lou very few people know, a man as guarded as he is immense. Love him or hate him, bodybuilding superstar Lou Ferrigno has achieved legendary status within the iron world and is widely recognised as the sports second most identifiable personality - the first being a gentleman whose name begins with an A.
Lou's rise to fame came not as a result of a spectacular succession of bodybuilding victories, as he rarely won at the pro level. Rather, his international success, and ongoing popularity has occurred through various bodybuilding-related spin-offs such as acting and appearances. His amazing size - easily the largest bodybuilder of his era at 6.5, 275 pounds, complete with 60-inch chest - along with the publicity he gained through this imposing presence captured the imagination of Hollywood producers, and propelled him into the acting world. With his first major beak coming through the popular 80's Incredible Hulk series, Lou became a regular fixture in living rooms across the world. This increased public profile led to opportunities as an elite personal trainer and further acting roles, many public appearances, and endorsements. Today, nearing 60 and still looking impressive, Lou enjoys a celebrity status that many seek, but few achieve. As a bodybuilding star Lou is significant from an historical perspective, as he, along with Arnold Schwarzenegger, helped to change the way the public viewed bodybuilders. Primarily through his appearance in the 1977 landmark, Pumping Iron, Lou gave bodybuilding a human face, a persona complete with the usual human insecurities and weaknesses people could identify and sympathise with. Although no bodybuilding slouch, having won both Mr. Universe and Mr. America titles, Lou easily lost his battle with the more charismatic Arnold in this film. But he more than redeemed himself over the years that were to follow, to become the popular figure he is today. Lou's early years were characterised by struggle. A hearing problem, which proved to be a major barrier for Lou in his younger days, caused him to seek refuge in weight lifting. From this pursuit grew a burning passion to be the best bodybuilder that ever lived. When bodybuilding promoter and trainer Dan Lurie first met the shy 16-year-old Lou in 1967, he quickly saw the young kid from Brooklyn's bodybuilding potential, even though at 6.5, Lou only weighed 165 pounds. In the six years that were to follow, through Dan's guidance and compassion Lou became a giant among men. By the time he was 19, his weight had increased to 235, cut. Dan knew he was onto something and had big things planned for his newest, largest protégé. Responsible for promoting Lou through Muscle Training Illustrated, the magazine he published, Dan also continued to coach Lou in all aspects of bodybuilding, all the while preparing him for the ultimate showdown, an Olympia battle with the current champ Arnold Schwarzenegger. As history will show, Lou did eventually go on to challenge Arnold at the 1975 Mr. Olympia in Pretoria, South Africa, but by this stage Dan was out of the picture - in 1973, under controversial circumstances Lou and Dan parted company and remain distant to this day. Dan has now chosen to speak out about his days with Lou and the circumstances that led to their parting. In the following interview, Dan provides insights into a Lou very few people know, a man as guarded as he is immense. When and under what circumstances did you first meet Lou Ferrigno? I first met Lou in 1967. Lou was 16 at the time; his date of birth is November 9, 1952. In 1967 he was 6'5" and weighed about 165 pounds. My associate editor, and the only friend Louie had, was a fellow by the name of Tony Badal. Tony brought Lou to me and asked me to give him some publicity. Upon meeting Louie, I asked him one question: "How far do you want to go in bodybuilding?" I told him that winning the Mr. America in five years should be no problem. He said, "I don't want to be no Mr. America, I want to be the best built man that ever lived." I said, "Do you realise what you are saying." He said, "That is what I want." That is right. But I never had a contract with him; it was more like a father and son arrangement. Over three years I helped him to pack on a lot of muscle and at age 19 he entered the 1971 AAU teenage Mr. America contest at around 235 pounds cut. But he had a hearing problem, so when he stood in the back of the big room where they did all the judging, he would get overlooked. The judges in these shows would get certain competitors to step forward. I remember him saying he was never so embarrassed. They would speak to him while he was at the back and he would not hear them. One judge actually said, "What are you, stupid or dumb? Don't you hear me?" Louie told them he was deaf. At the Junior Mr. American he placed fourth. But he should have placed higher. I remember that I payed his expenses for this show. The first thing I did was to buy him clothes, because he was a sheet metal worker. I bought him pants and shirts to help make him look presentable so that he could travel out of state to shows. He had never traveled out of state before. You say Lou should have won his first big contest, the Junior Mr. America. Do you think it was his hearing disability that caused him to lose? Yes. After this show he came back to me and said, "I will never enter an AAU show again." I told him that he could not judge the whole thing by one or two judges that made him feel bad. They did not know he had this problem. They were talking to him and giving him directions as he stood onstage, and he could not hear them. But in the same year, 1971, I ran a Pro Mr. America teenage show and Louie came out first. And that was after giving him, from 1967, so much publicity in my magazine that it encouraged him to train. Of course, we issued a statement saying that in four years this sixteen-year-old kid would challenge the great Arnold Schwarzenegger. And of course I did it only to get him known, to publicise him. But he trained very hard and it payed off. Lou was very, very determined to succeed. He lived it (bodybuilding) night and day. Lou was shy, but very focused. He was very humble and very insecure. Never had confidence in himself. Even in my last contest in 1972, where he competed, the night before this contest we spent about two hours together working on his posing, as this was the most important thing for him (the posing). The development was already there. We went over everything and he looked great. The next day onstage I could not believe it was Louie up on that stage. He took a water pill. He was told this would cut him up even more, but it was not so. He had lost all his definition and was totally smooth. There was a fellow from the Weider organisation by the name of Bill Grant who I allowed into my show, as I had a practice of not disqualifying anyone from competing in my shows. Bill Grant was told not to enter my show because I would not let him win, because Lou was my number one, star attraction. When Bill was announced as the winner, he cried onstage. He could not believe it. Lou's father (Matty) was very angry with me. He wanted to know why I did not fix the contest to allow Lou to win. I had eighteen judges. I never judged my shows so I could not determine the outcome. Leading up to this contest Lou told me that his father hated him. I said, "How can your father hate you." Lou replied that his father did not want him to train with weights, but to train to become a football player. Lou said he did not want to play football. One thing Lou's father did not like was what he had to eat to become a bodybuilder. When he was training, Lou's main diet was tuna fish and the father could not stand the smell of this. Later on I got to know Lou's father quite well, before Lou left me in 1973. Lou's father, instead of being a father, wanted Lou to win at all costs. I always told Lou to stay away from steroids because in my opinion they would lead to liver cancer and other problems. I told him he could develop his body just as good without them. He told me he would never take steroids. Of course when I found out that he did (take steroids) I went to his father and said, "Do you know that Louie is taking steroids. Do you know the dangers of these drugs, they could end up killing him." And you know what his father said? "It is not important whether Lou lives or dies, it is important that he wins." I said, "Matty, you are a sick father." His father was with the police department and he did not want Louie to train at all. He did take the credit for Lou's success on Pumping Iron like he was training him. But he never trained Lou. That was just all done to look good for a fellow by the name of Julie Levine, whose gym, the R and J Gym in Brooklyn, Lou trained at. I told Lou years before this time that I could help him with his posing and with publicity. I told him the rest was up to him. But Louie had a lot of people giving him different advice at that point in is career, and he got confused. What else did Lou do to surprise you around this time? One thing he did was he agreed to be the best man at the wedding of Tony Badal, the man whom I give the credit to for finding Lou in the first place. Tony actually brought Lou to me. Lou would come to all of my shows and WBBG question and answer sessions at the gym. Lou would answer questions for the average gym goer at these gatherings. And Lou was supposed to be the best man at Tony Badal's wedding, but for some unknown reason he never showed up and never spoke to Tony after that. To this day I am still in touch with Tony and he still does not know what happened, why Lou got so angry. 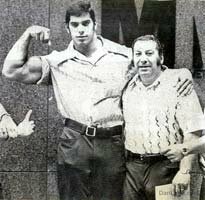 What additional involvement have you had with the Ferrigno family over the years? I had met the mother a few times. When I sent Lou to London to enter the NABBA Universe in 1972, his mother thanked me for taking him out of the shell he had been in for most of his life. She confided in me that he never had any friends. What I was doing for him made him feel so good and he felt important for the first time in his life. She thanked me so much. I never had any problems with Louie's mother. It was his father who tried to hurt me in so many ways. He went into the same barbell and equipment business as me and he used Louie's name and kept all the profits. Louie never got a penny from his father. Then Louie ended up suing his father because he felt it was wrong to use his name. More recently Louie has sued his brother for the same thing, even though his brother did not have the word Lou as part of his company name. Lou assumed people would relate the business to him, as it is under the Ferrigno name. What are your personal thoughts on Lou's action against his brother over the Ferrigno name? I don't know too much about that. When Lou took me to court though, it lasted several weeks. Lou got himself a lawyer who could not handle the final court case, so he hired a specialist to try to win the case for him. I was told by Lou's lawyer years later, that he was in cahoots with the judge that day. There was no way he should have won over one hundred thousand dollars, and that is what he got from me. One other thing: in approximately 1975 I was at the Mr. AAU America show in California and Louie and I bumped into each other backstage - this was after the lawsuit against me - and I guess I surprised him. He said, "How are you, how is your wife and son." He was very friendly with my son Mark, he grew up with him, and they are about the same age. Then he just left. About half-an-hour-later, when I ran into him a second time, he said this, and this is what is going to be in my book because it is exactly what he said: "You dirty Jew son of a b!tch. The happiest day of my life and my father's life will be the day you get buried." How did you respond to this statement? Well, it almost got us into fight because I said, "Louie, God will take care of you. For how I treated you and for what you did to me in return, God will take care of you." They separated us thankfully. I am only 5'6". That was the end. I never heard from him after that. What do you think Lou's motivation was for saying such a terrible thing to you? I do not know, but what I do know is my son went to a sporting goods show many years ago in Atlanta Georgia. Louie was on stage giving a seminar and he spotted my son. He said, "I can't believe it, I have to get off the stage and say hello to an old friend of mine. And they both hugged each other and they both treated each other like best friends. He never had anything against my son, but he hated me. What training program did you have Lou on in the early days? I told him to do mostly lighter weights with higher repetitions, but Louie liked to lift heavier and do less repetitions. And he only wanted to bulk up. I think he got up to around 285 at one time. He said when he cut back down he would be even better. I said, "Louie, it does not work that way." I wanted him to gradually build up and get good definition. But he had his own way of training. I gave him my proteins, and told him to eat whatever his mother was feeding him at home. But training was the key thing with Lou: he was working out extremely hard. In 72 and 73 he looked just great. I am surprised that he is not suffering today from any steroid related problems though. Were steroids a major contributor to Lou's success? They were used widely back in those days. Arnold was taking them and advertising he was taking them. And, yes, they did help Lou to become as big as he became. Yes. I got him his first television show in the early seventies, an appearance on Midday in New York City. I was featured and had several bodybuilders with me. I had Louie seated in the audience and when the cameras stopped at him he spoke a little and then removed his shirt so everyone could see his huge muscles. It was the first time he appeared on television. I also introduced him to the man who made the Hercules pictures with Steve Reeves, Joseph E Levine. I told Joseph I had a new Hercules. He said, "We can't use him. We will have to dub his voice in. We will not go to that expense." I tried so hard and even told Louie he had to think about making a living. I told him it was very hard to make money in bodybuilding unless you sold products and had a business. He said, "Money is not important." I said, "Let me set you up Lou. I can send you to an insurance company where they can train you on how to sell insurance." I told him that with the publicity he had, people would be happy to deal with him. No matter what I tried he was not interested. He just went back to sheet metal work and most of the time he was laid off due to the seasons. Did he show any indication back then that he might become a famous actor? No. Except when I took him to Joe Levine for the Hercules pictures. He was too young at the time. He lacked confidence. All he could talk about was bodybuilding. He was not able to communicate with other people in a normal way. Did you have any involvement in Lou's preparation as he trained for his biggest ever contest, the 1975 Mr. Olympia in Pretoria, South Africa? I trained Lou up until 1973. Lou stayed with me from 67 through to 1973. Basically the last day that Lou was with me there was a contest I ran, a Pro Mr. America that featured Steve Reeves. Of course Louie wanted all the publicity for this show. He didn't like the idea of me bringing Steve Reeves over as the star attraction. I said, "Louie, you will have your turn, this guy (Reeves) is going to fill the house, you are not going to fill the house." Till the day of the contest Louie was with me. 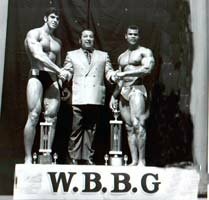 What happened was Weider has a contest on the same day as mine, as he wanted to knock me out of the picture. I spoke to Louie and told him that someone had told me that he was going to enter the Weider show. He said, "That is a lie, don't believe it." He said he would never do that after all of the things I had done for him. Lou told me he would see me at the show. "You can see if I am lying to you," he said. One thing I did for Lou was to send him to London to the NABBA Universe. I also gave him all the protein foods he needed for free, Olympic weight lifting sets to train with. I did everything for him, but I never had a contract with him. What happened later on was that he ended up suing me. He had a release from his picture for my product Jet-707. He cost me a lot of money by suing me because he was at that time a celebrity. He had begun staring in The Hulk. But I was like a father to Louie. I put him on the cover of the 32nd issue of Muscle Training Illustrated, the May 1972 issue. On the cover it says, "exclusive pictures, a big challenge, new giant rivals Arnold Schwarzenegger". We had to do that to tell the world we were to challenge Arnold. Getting back to our spilt, the father made a contract with Joe Weider for fifty thousand dollars for five years. That is ten thousand dollars a year. That is all he got, but fifty thousand does sound like a lot of money. So after assuring me he would be at my show in 73 he failed to turn up and went with Weider instead. What tips did you give Lou to refine this aspect of his presentation? I always concentrated on posing. It was to me the most important part of his showing. We would put the music together and have him pose in such a way that it would resemble a ballet dance. He would come to my office two-to-three-times-a week for years. I always wanted to leave early on a Friday night. My wife would make a big Jewish meal. I told Louie I needed to go home. He was coming in too late, about seven o'clock. I told him to come in earlier, around four o'clock. The most important thing I had him focus on was his confidence. In those days they did not have mandatories so we worked on his routine. In Pumping Iron, Lou came across as being very reserved and lacking the necessary killer instinct to take down Arnold. Was Lou really like this? He was still a kid at that time. I imagine he has more confidence today, but at that time he was very shy. Louie wasn't the dumb guy he was made out to be though. In my opinion Louie was a bright guy who read a lot. But when people spoke to him, they did not want to bother with him because if he could not read their lips he was not able to answer them. And, of course your might say, "This guy is stupid and dumb." But he was not this way; he was a bright guy with a handicap, a hearing problem. Lou seldom does interviews and is thought by some to be disrespectful to his fans. What are your thoughts on this? I don't know about this. I don't keep up with what Lou is doing anymore. We just broke off and that was that. Was his father really the motivating force we saw on Pumping Iron? Louie's father hated him doing bodybuilding because he thought Lou could make money being a football player. He did try out for a team in Canada and he did not like it. Louie did not want to get hit. Football hurt and Louie was a peaceful guy. Louie's father motivating him on Pumping Iron was 100 percent lies. In reality his father hated his training. His father went with him just to make the picture look good. Lou has become one of the more prominent figures in bodybuilding history. What do you think he should be remembered for? Lou hurt me so much in those days, and for him to double-cross me and do what he did I will never forgive him. All he had to say was, "Dan, my father made a deal with Joe Weider and I am being offered fifty thousand dollars for five years." Be a man about it, tell me. I would have said, "Louie, good luck to you, you have my blessing. I have helped you and gave you a road for six years, made you famous, made you known; the rest is up to you. Good luck." As far as being a representative for the sport of bodybuilding, how should Lou be recognised? Well he should be recognised as one of the greats in the field of bodybuilding. But he should also say to everyone that he did take steroids for most of his life. Just tell the truth. I do not think he will ever admit to this.